Jasmine perfumes of the Islamic school can be notoriously ill-bred. Throughout the Middle East deft but cloying synthetics have inundated the non-alcohol-based perfume oil tradition. Each day, erstwhile scent merchants pawn off synthetics on a well-heeled unsuspecting clientele. And no one is the poorer for it. We’ve all been taught that synthetics are good, and indeed they are. But Hedione discussions aside, for me jasmine is the one big glaring exception. Some Middle Eastern jasmine perfumes are so roughly constructed that they only express one facet of this extraordinary blossom: a sweetness so sweet and unpleasant that it makes my teeth ache. In Mumbai, I ask myself, is there a toilet bowl cleaner that smells like this? And there very well may be. 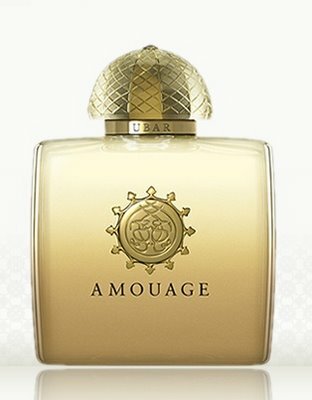 All of which brings me to the reorchestration of Amouage Ubar, a fragrance for which words battle in my head for precedence: balance, authenticity, mystery, splendor, and spirit. And yet I want to dismiss them all, because, being so overdetermined, they push the concept above the experience. Simply, Ubar is a superlatively pretty perfume. And very well-done. It was blessed with another one of those pre-recession, spare-no-expense-like creative briefs that many perfumers would die to be able to execute, if only for the sheer rise that must come with ordering a kilo of top-grade jasmine absolute. Ubar is not revolutionary, unless in 2009 one still were to view the cuisine of, say, a Marc-Antoine Carème as pushing the envelope. I, for one, cannot accommodate very often, if in fact at all, an entire brace (a flock! people, a flock!) of roasted duck à la Brétonne, let alone a purée of hummingbirds’ tongues. But, let’s face it, we only have so much patience for revolutionary fervor in our times. Look at all those Comme de Garçons scents of the nineties that people who “didn’t wear perfume” wore. Many were hideous. (If we’d stopped at the fashions, we’d have been great. But, lightbulb dust burning smells and carrion ... spare us, O Lord.) Luxury that masquerades as nothing but itself is perfectly OK by me. And a well-constructed perfume is hardly luxury; it should be a requirement of the industry. Strike one, strike two, you’re out. Better to have sold a few million bottles of Febreze or that Indian jasmine Toilet Duck I mentioned than to author some abominable pink bugspray. Ubar continues that marvelous rounded approach to a dominant floral note that we found with Lyric Woman and Lyric Man. Creative director Christopher Chong and his perfumers know what they’re doing with the lily-of-the-valley note and those lovely basso registers of Bulgarian rose, sandalwood and civet. But here the aria is from a Massenet opera like Esclarmonde, instead of Verdi. And it’s not Callas at La Scala I’m hearing, but Sutherland at the Dallas Opera. Some perfumes are haiku (and often not very good ones); some are chapters (longish in style––they make you crazily anxious for plot twist that, alas, seldom comes); and a choice few are what I’d call prose poems. These late winter days, this last is the category piques that my interest the most––and, within it, the great chypres: Coty’s eponymous creation, Guerlain’s Mitsouko and Sous le Vent, Carven’s Ma Griffe, Aqua di Parma’s Profumo (both iterations), and Amouage Jubilation 25. Looking at them in front of me on the table is like regarding a group of siblings, their ages spanning nearly an entire century. A few brunettes, a redhead, one jet black, a blonde––but, boy, they’ve all got that nose. I won’t use a word like aristocratic, but Mitsouko, Profumo and Jubilation 25 strike me as the real achievers of this family. They take a vital lesson from their father: follow your heart but keep your feet on the ground. The nucleus of each is a triad of florals that veer toward the complex: rose, ylang ylang and jasmine. (If you added some carbon rings, you’d have the architecture of Chanel No 5.) And while this floral heart is important to the overall caress of the perfume, it’s those feet that make the real difference. Fine patchouli, frankincense, labdanum, oakmoss and vetiver. The flowers still sing but the rhythm is quickened, and there’s just this wondrous sonorous depth when everything comes together that reminds me of one of the segments of Mussorgsky/Rimsky-Korsakov’s Pictures at an Exhibition. There’s nothing old-fashioned about them, except maybe the connotation of a studied blue-stocking elegance. More of us should get to know them and their makers better, and should encourage and support their survival in a world of cotton-candy-air and soulless haiku. 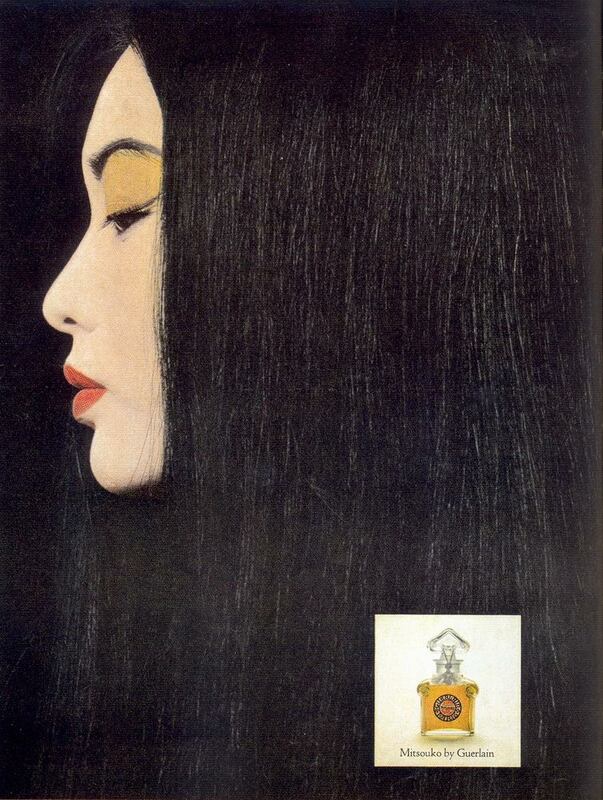 Image: Mitsouko advertisement, c. 1976.